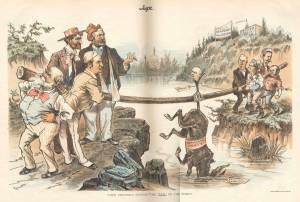 This cartoon conveys the message of Grover Cleveland’s unpopularity among some leading Democrats who supported the national ticket only in the expectation of political patronage. They believed the spoils of victory would be delivered through the influence of Adlai Stevenson, once he assumed the office of vice president. While assistant postmaster general during the first Cleveland administration (1885-1889), Stevenson became notorious for firing 40,000 Republicans and replacing them with Democrats. (The Post Office was the largest source of federal patronage.) His actions earned him the dedication of Democratic politicians and the ire of Republicans, who blocked his nomination in the Senate to the Supreme Court of the District of Columbia (not the U.S. Supreme Court).